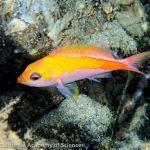 Some incredible new footage was recently shared, highlighting a remarkable case of mimicry found in a very poorly known species of dottyback—Manonichthys jamali. Described in 2007, it belongs to a small group of pseudochromids which occur only in the Coral Triangle and which are known to frequently associate with large barrel and vase sponges. 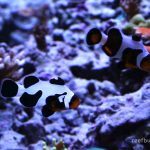 The most familiar of these fishes is the Splendid Dottyback, M. splendens, which has become a fairly ubiquitous offering in the aquarium trade. True to its name, M. splendens is arguably the most aesthetically pleasing member of the genus, but, in general, the other half-dozen or so species all share a fairly similar pattern consisting of a dark body accented by brightly colored scales. Jamal’s Dottyback, Manonichthys jamali, is a small fish known only from a small area of the Bird’s Head Seascape in Indonesia. 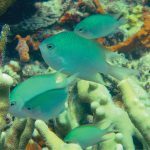 It is believed to mimic the Blackbar Chromis. But in Jamal’s Dottyback, we find a stark contrast with its appearance. Instead of the dark base tones seen so consistently among its congeners, M. jamali is, rather, a mostly yellow fish. It’s xanthic raiment gives way to a thick black bar posteriorly, followed by a white caudal peduncle. 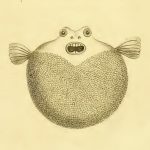 In total, it looks rather little like its closest relatives, but, despite these differences, there is every reason to believe that this unique fish is of fairly recent evolutionary origins. The majority of Manonichthys dottybacks seem to form a single species group which is distributed in a familiar allopatric pattern. The map below gives an idea of where these various taxa are known from, and it’s essentially the same distribution we might find among other heavily speciated groups from the region (e.g. Paracheilinus filamentosus flasherwrasses, Chrysiptera hemicyanea damselfishes, Hemiscyllium sharks). 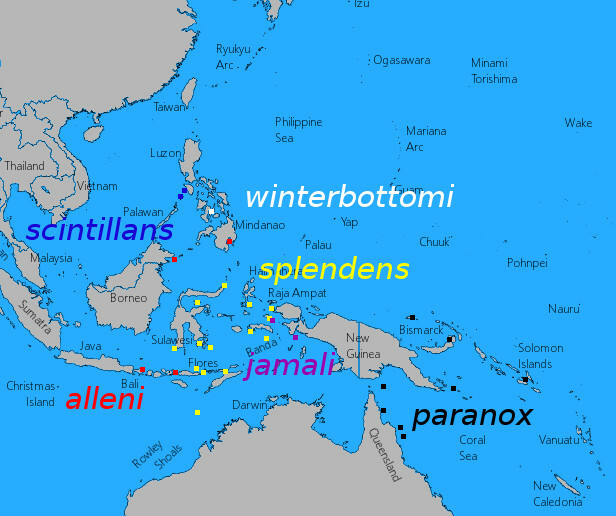 Distribution of the Manonichthys splendens species group. Jamal’s Dottyback is thus far known only from a few reefs along the southwestern shores of New Guinea, helping to explain its relative obscurity and continuing absence from aquarium exports. Precisely who this species is most closely related to is difficult to discern at the moment, as this genus is yet unstudied genetically, but it could very well be another obscure fish found on the other side of New Guinea, the Midnight Dottyback (M. paranox). 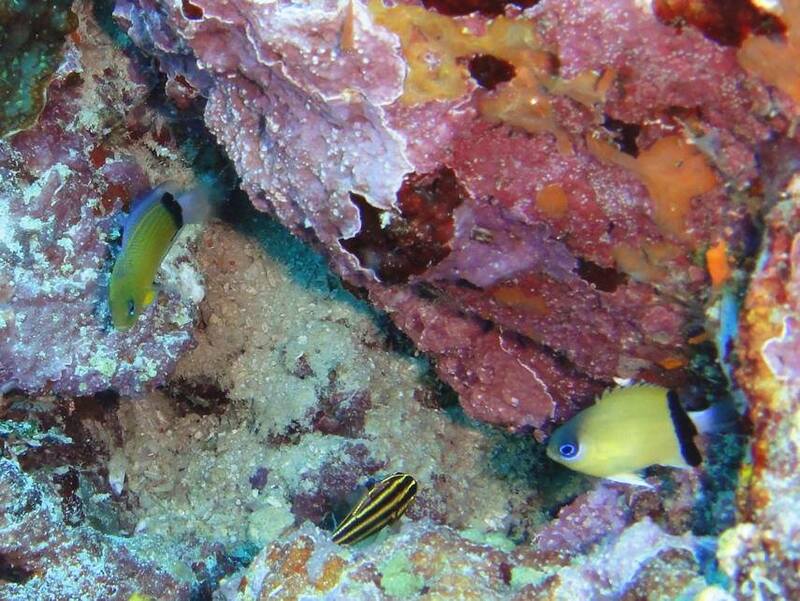 These two are unique within Manonichthys for showing strong mimetic relationships. The darkly colored M. paranox bases its disguise on the Midnight Angelfish (Centropyge nox), even going so far as to swim in a similar fluttering motion, while the very different appearance of M. jamali is a near-perfect replication of the Black-bar Chromis (Chromis retrofasciata), a species with which it tends to live in close proximity. Manonichthys jamali with its model, Chromis retrofasciata. Credit: KAKO. 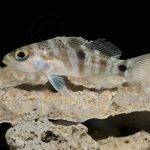 Little is known concerning why this mimicry has developed and how it might benefit these dottybacks, and it’s all the more perplexing when we take into account the absence of mimicry for the other members of this genus. It’s perhaps most plausible that this is an example of Batesian mimicry, wherein the rather slow and ungainly dottybacks take advantage of their resemblance to the quick and agile angelfish and damselfish that they mimic, ultimately reducing the predation that they face. Or it could be that this is more akin to aggressive mimicry, with the dottybacks being better able to sneak up on their benthic prey by resembling a zooplanktivorous damselfish and a spongivorous angelfish. But why did this arise only around New Guinea, and why did these two populations end up partnering with such different models for their mimicry? Both the Midnight Angelfish and the Black-bar Chromis occur throughout the West Pacific, so one would think that there would have been a strong incentive to develop these same relationships elsewhere in Indonesia and the Philippines. But, looking at the Splendid Dottyback, this is clearly not what happened. In this light, Jamal’s Dottyback is one of the more enigmatic of coral reef fishes, at the vanguard of evolutionary novelty.